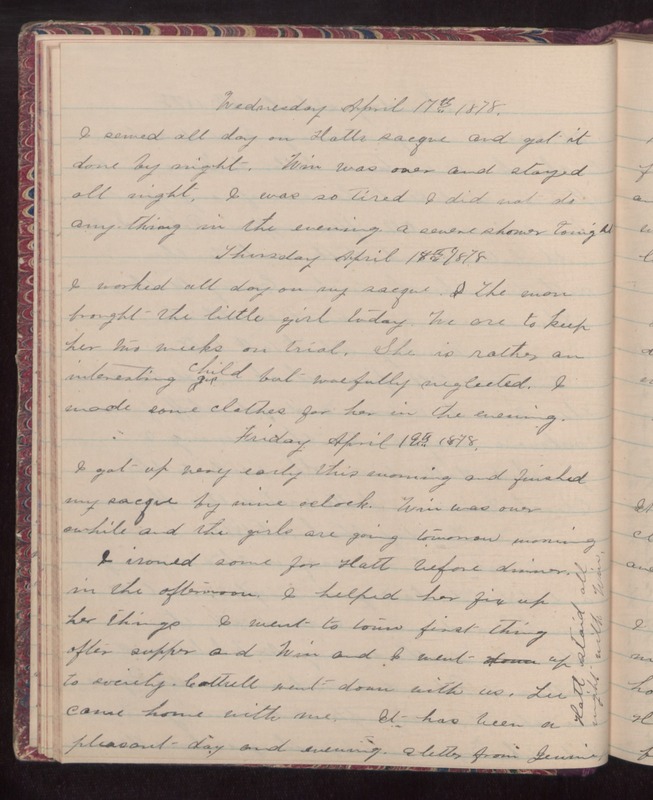 Wednesday April 17th 1878 I sewed all day on Hatts sacque and got it done by night. Win was over and stayed all night. I was so tired I did not do anything in the evening. A severe shower tonight. Thursday April 1878 I worked all day on my sacque. The man brought the little girl today. We are to keep her two weeks on trial. She is rather an interesting child but woefully neglected. I made some clothes for her in the evening. Friday April 18th 1878 I got up very early this evening and finished my sacque by nine oclock. Win was over awhile and the girls are going tomorrow morning. I ironed some for Hatt before dinner. in the afternoon I helped her fix up her things. I went to town first thing after supper and Win and I went up to society. Cattrell went down with us. Lee came home with me. It has been a pleasant day and evening. A letter from Irwins[?]. Hatt stayed all night with Win.